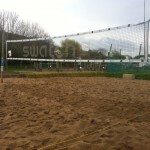 Below are photos and text with full detailed information on how to build your beach volleyball court. The ground was fairly level although on a slight curve at both ends. 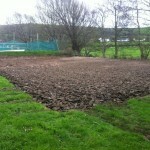 The turf from the site was stored and reused to cover the new banks which would be built around the edges. 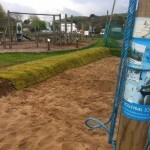 It was also used to create a sharp edge to the sand pit once finished. The turf was rolled this up and stored under tarpaulines, keeping it as damp as possible, it was waterd at one stage while still rolled up. Plant Company, Adams Plant was used to do our digging work. 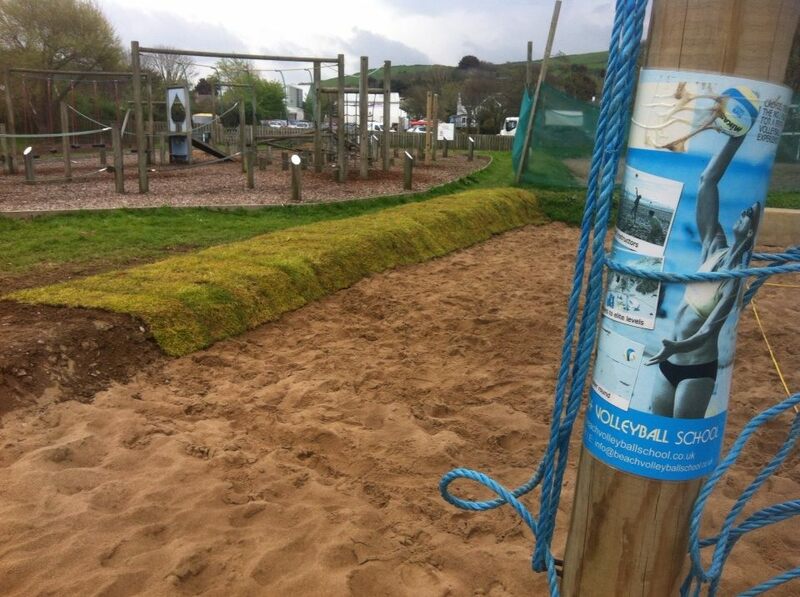 A local company based in Croyde. 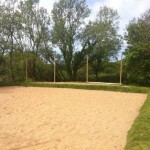 They had experience in building menages for horse arenas, which are very similar in construction to beach volleyball courts. 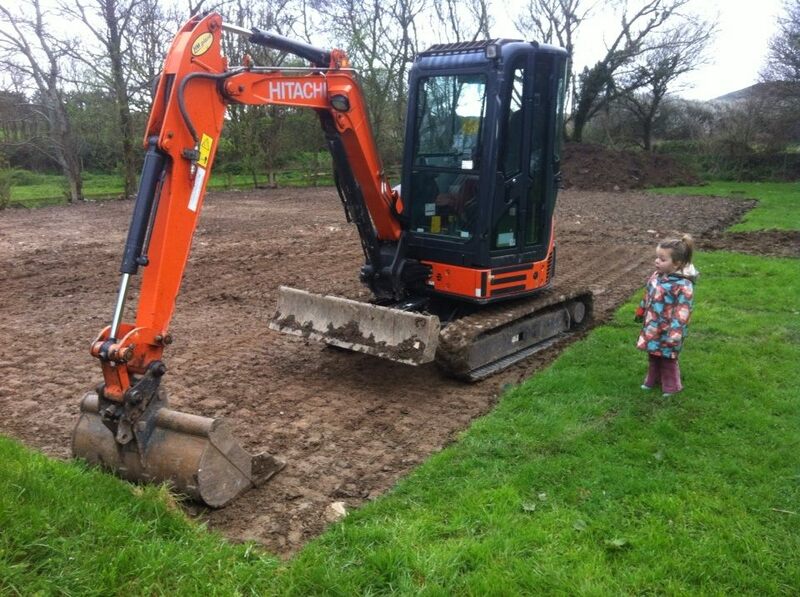 They are also available to work in the South West region, please contact Beach Volleyball Inc. A large bucket was initially attached to the digger, for the first phase of digging out the pit and also a dumper truck was used to move the earth to the banks. 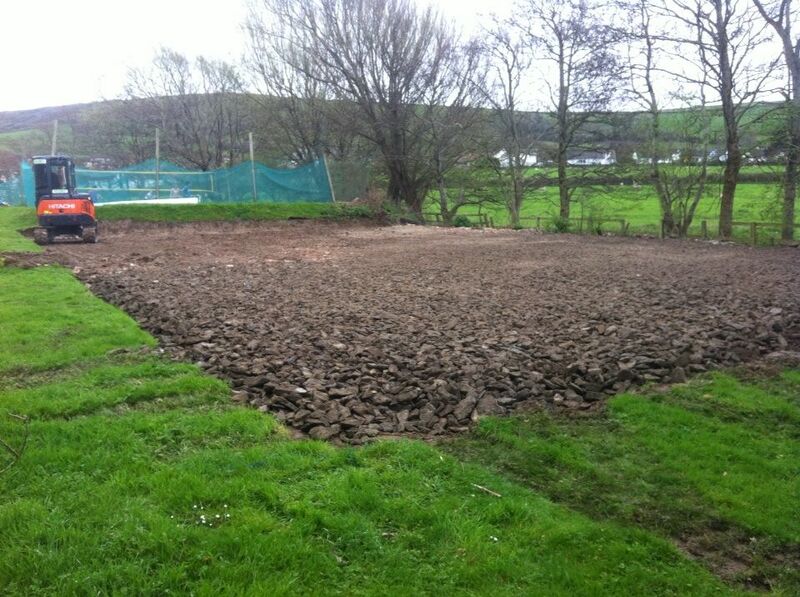 Site levels were used consistently to create a level pit and most of the earth went into building up the ends of the pit, which sloped away from the centre. 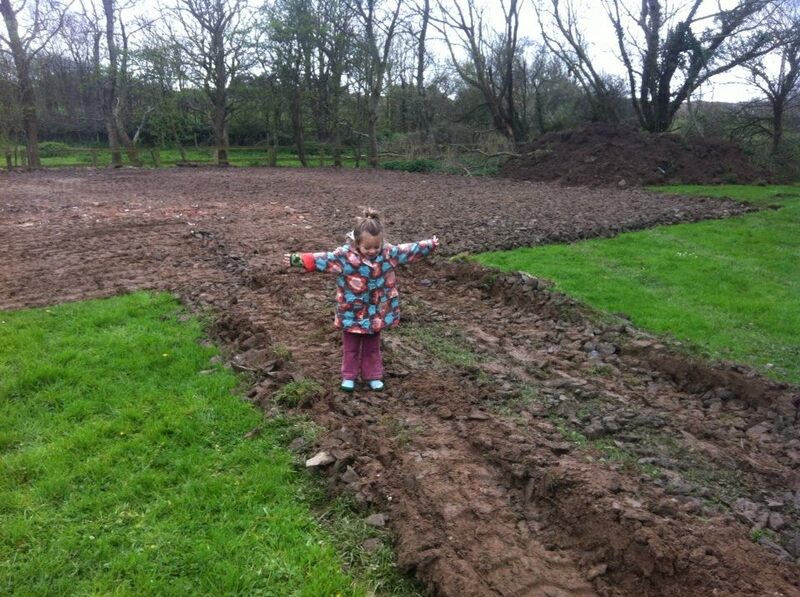 The location of the sandpit was directly next to a stream so the soak-a-way was easy to build into the drainage. Locate the soak-a-way with the plant construction when they do the site visit. 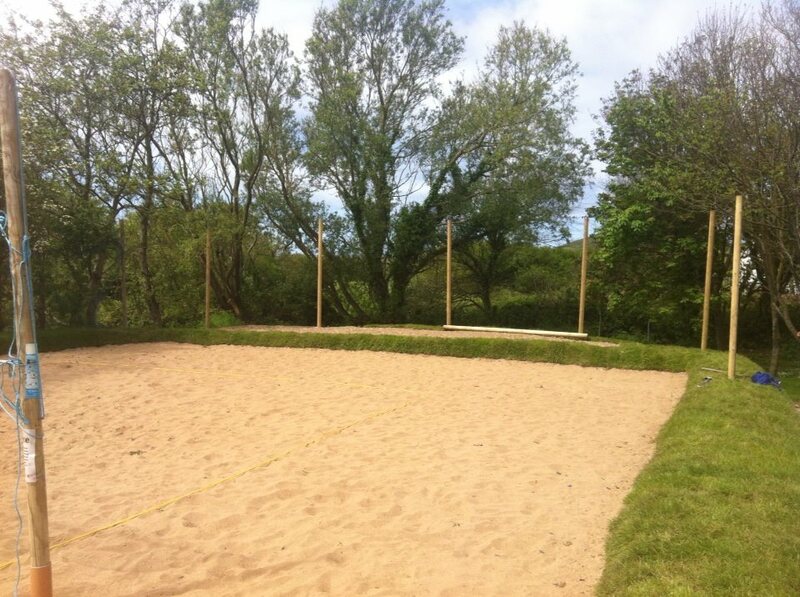 For our net posts we used 4″ 100 mm-treated round wooden posts, 3.6m in length. These have been in use for 5 years and havenâ€™t needed to be replaced. 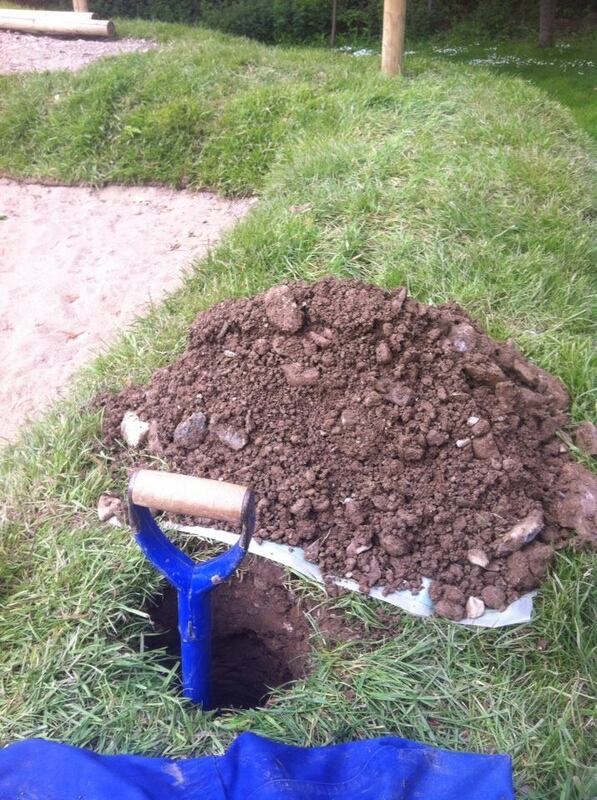 To secure the posts we dug two holes, to a depth of 1.5m from grass level. Using 110mm round drainage pipe approx. 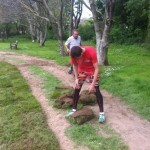 1.5m deep, which were used to sleeve the wooden posts. Suggest to put net sleeves in at this stage as it easier to do before stone and sand are layed. In the bottom of the pipe, once it was placed into the ground we put .5m of small drainage gravel. 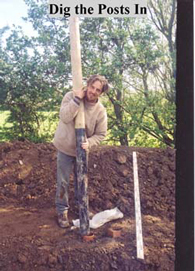 Also before putting the posts into the pipe we treated them with bitumen paint to add to the longevity. Not necessary as long as you have treated wooden posts but a nice added extra if possible. You can also cement the sleeves in to give them greater strength. 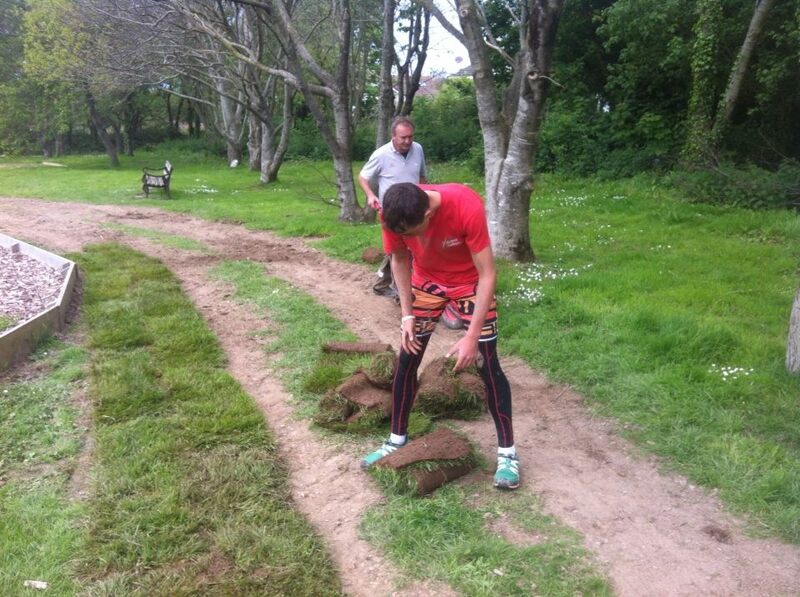 After the sleeves for the nets posts have been dug in the drainage pipe is then placed into the earth. This is done in a zig zag fashion across the bottom of the pit. 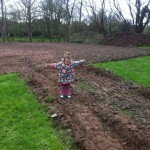 Also the soakaway pipe was led towards the river, but most sites will need a soakaway. 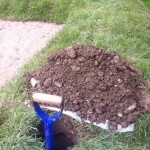 The drainage stone is then laid over the top to a depth of 20cm. The drainage stone should be 50-150mm clean. 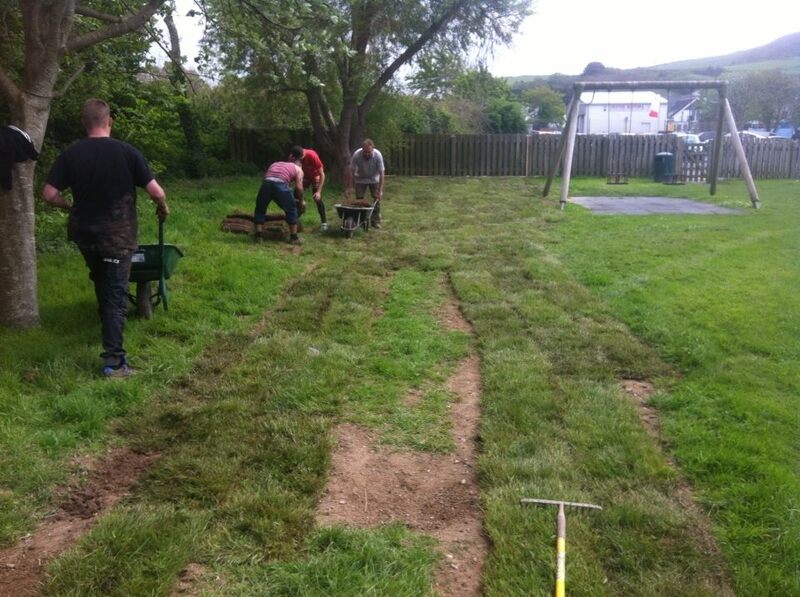 This is then rolled and compacted to create as level an area as possible. Between the sand and the stone is a semi-permeable membrane (teram) which keeps the sand from going through into the drainage. Take care when unloading the sand onto the membrane so that it isnâ€™t torn by the wheels of the dumper truck as it un-loads the sand. 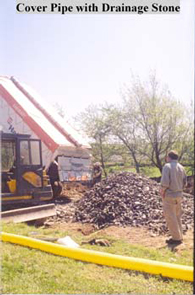 Layers of the membrane were sited and then sand dumped, followed by another layer of membrane so that the truck could drive onto the drainage stone for as long as possible. By dumping the sand it means that the sand is placed fairly evenly and less work has to be done at a later stage. 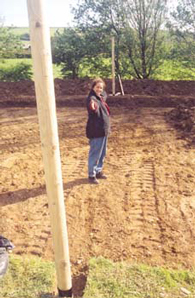 As we had built banks up around our court we only had once access point to load the sand, if you donâ€™t then you may be able to lay the membrane and dump the sand from various points. 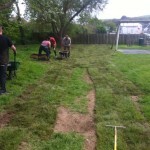 With a one-access method the destruction of the grass by the trucks as they unloaded was kept to one area and as explained before the turf to this access was cleared. Also if you have relayed any turf, water it for a period of 3-5 days to ensure good growth and to resetablish itself. 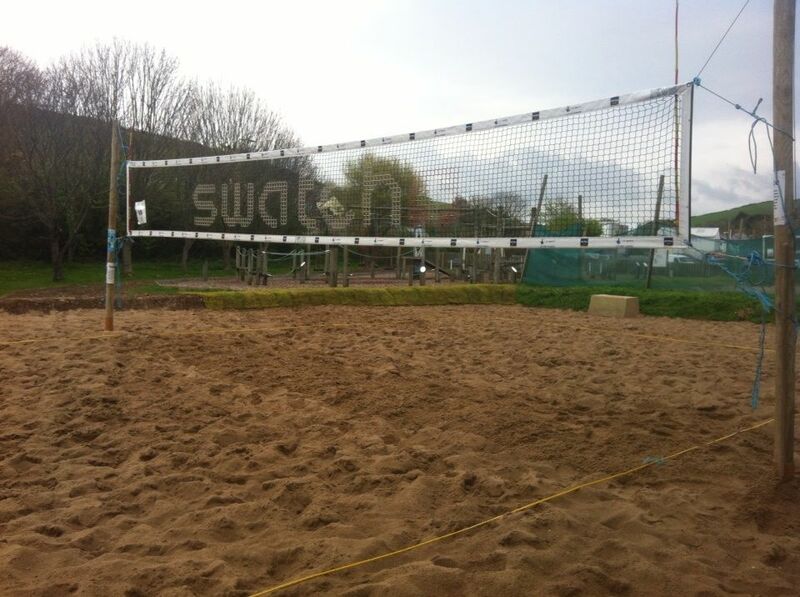 The sand was then levelled as much as possible by the digger, the sand was laid to a depth of 40 cm which is official depth for FIVB and also the best for safety for your players. The original size of the court was 11mx 22m this gave us a 1.5 m clearance from the sides and 3m clearance from the back line which was enough to allow someone to jump serve effectively. The total sand was 132 tonnes and 60 tonnes of stone. The local water board had to put a sewerage pipe through the court and when they re-built it, is now 12mx24m. 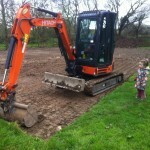 Anywhere in between 11mx22m upto 18mx26m is sufficient to create a workable court. The FIVB official size for a court would be 16mx8m for the court markings and 5m all the way round so making the size of sandpit 18mx26m. Sand for this area would be in the region of 240 tonnes, depending on how wet it is on arrival. Your plant dealer should be able to help you with your tonnage for sand and stone depending on the size of the area you are going to build. 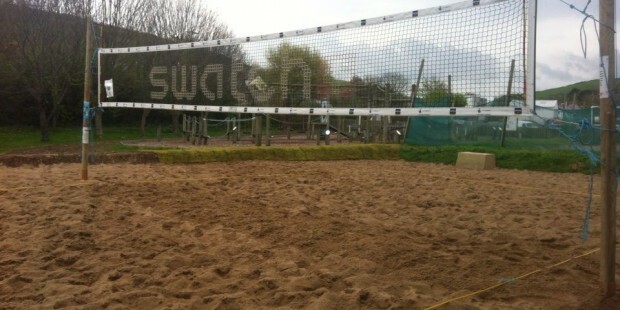 The posts were put into place and the net attached! There are two methods for attaching the net at the top of the post. The simplest method for attaching the nets is to create two small grooves on the top of the post, which the nets cord goes over and sits into. To keep the net in place two staples can be hammered over the cord to avoid the nets moving from the groove but with enough tension this isnâ€™t essential. Alternatively holes can be drilled 10 and 20 cm down from the top of the post and metal loops put through attached to a steel bolt. This again isnâ€™t necessary but if you want to secure the net then the steel bolt can be used to padlock the net to the posts. Not the best way unless you use an anti-rust padlock. Depending on the area the net is to be sited and for ease of vandalism the simplest method is to put in a steel or kevlar string to the top of the net. Hammer a staple into the hook from the steel wire above easy reach, which anchors the steel string. This can then only be taken out with a prising tool. The other side, using added rope onto the steel,tie off by using a heavy duty staple which acts like a loop,which is partially hammered in. Site this on the outside of the post between waist and shoulder height.